Forget the old wives' tales and follow these top flower care tips from our expert florists. Fill a clean vase two thirds full with fresh water. Cut 2cm off each stem at an angle. remove any leaves that have fallen below the waterline. Enjoy watching your flowers bloom. Remember the more flowers in the arrangement the more water they'll consume, so check the water level in your vase daily and keep it topped up. Flowers are thirsty beings, some varieties more so than others, so this is key to keeping them looking their best for longer. Ideally the vase should always be three-quarters full of water. Don't forget to change the water completely after day two and to clean the vase thoroughly before refilling. 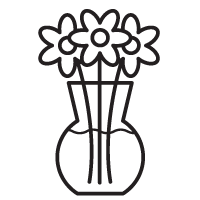 This simple practice can really help extend the vase life of your flowers.